3D printing is a technique of an additive manufacturing process that transforms your virtual designs into realistic 3-dimensional products. It can easily be considered the most accurate method of developing physical prototypes. If you want to learn about making 3D prototypes, there are a couple of things that you should know. These include setting up a 3D printer, using the right materials, and knowing how to choose the suitable printing technology. In this guide, we’ll tell you all the basics you need to know to get started with your 3D printing. How is 3D Printing Beneficial? Well, 3D printing is superior to traditional means of manufacturing in a number of ways. When you’re 3D printing an object, you have total freedom to personalize it to your own liking. This is especially favorable for people who like to own unique things. By using 3D printing, you can make the product customized to the person’s exact individual demands. 3D printing can spare everyone the need to use tools for production. It reduces labor costs that are related to the assembly by making products that are designed with enough complexity to include the intricate details. 3D printing is one of the most energy-efficient technologies. By using 90% of standard materials and by having a reduced carbon footprint compared to the conventional manufacturing methods, it generally produces less waste. Sounds Great! But How Does 3D Printing Work? First of all, you have to design your 3D model on the computer. Then, you connect it to a 3D printer, press print, and watch the magic happen. And by magic, we mean the 3D printing process in which an object is constructed from thousands of minuscule slices of material. Starting from the bottom and making its way up, the 3D printer sticks those little layers together to produce a solid object in the end. You can use a 3D printer to produce moving objects like wheels or hinges. You can also 3D print saddles, frames, wheels, brakes, handlebars, and pedals. You can basically 3D print an assembled bike! What Else Can You Create with a 3D Printer? Basically, you can 3D print anything and everything, as long as you can draw a 3D model of it on your computer. You can 3D print precise designs that you make on CAD software, print numerous items that can be helpful to you in your everyday life such as battery adapters. You can also use your 3D printer to fix things by printing replacement parts instead of buying spare parts or a whole new object. How Long Does take to 3D print an object? It depends on the size of the object, the materials used, and the setting of the design. Smaller designs can be printed easily, but bigger ones will take some time to print. Other factors include the type of the printer, the speed of the printer head for FDM, the quality of the print and infill settings. Generally, SLA prints are the fastest to be done, however, more time is required to clean off their parts after the process is done. Are 3D Printed Objects Inferior or Superior to Traditionally Manufactured Ones? There’s no short answer for this because it depends on the object. For example, a 3D printed kitchen knife wouldn’t be as sharp as a steel blade, let alone retain its edge. On the other hand, 3D printed prototypes have enormously improved the manufacturing processes of jet engine components. Generally, you can’t say that 3D printed products are better or worse than traditional ones. Economically, 3D printing would be a great way to produce things in an efficient, resourceful, and cost-effective way that would definitely be superior to the conventional manufacturing process. What kinds of additive manufacture are there? There are plenty of techniques to make 3D prototypes but the most popular ones are the Fused Deposition Modelling, the Selective Laser Sintering, and the Stereolithography. FDM is an easy, affordable 3D printing method that can be used on a wide variety of materials. You fill the spool of the filament into an extruder where it’s meltdown and used to create one layer at a time of the 3D shape. In other words, FDM deposits single layers that fuse together to form a 3D object. SLA works by using a beam of UV light to draw patterns over a photosensitive pool of liquid resin. When the light hits the liquid, it solidifies by means of photopolymerization. Once a layer is finished, the base moves so the next layer can be worked on. The process is repeated until the 3D object is finished. SLA is a very convenient method for designers that are looking to convey their art in 3D. SLS involves exposing small particles of glass, plastics, or ceramics to hear using a laser of high power. Unlike the liquid used in Stereolithography, SLS uses powder. This powder solidifies once the laser hits it, and the powder surrounding the object acts as a support. SLM uses the same principal as the SLS process but also a higher intensity laser and only metal powder. In the SLM process, the small metal particles are melted together instead of fused. By melting them, they form a solid piece of metal that looks like it has been machined from a single solid block. Binder Jetting utilizes a powder bed as a source of material. Instead of using a laser, however, the powder (the metal) is glued together using an adhesive binder. The object, then, is treated with heat in a kiln to fuse or set the material. You can also use colored pigments to the binding materials to get colored prints. Choosing the correct material that suits the product you want to print is very crucial for getting the desired results. PLA is an environmentally friendly type of material. It’s biodegradable thermoplastic that is made from renewable resources like cornstarch, potato starch, and tapioca roots. You can sand down PLA and paint over it with acrylic paint. Some would recommend using a primer, however. ABS is currently used for a wide range of applications by industrial companies. It’s quite flexible, heat-resistant, durable, and strong. 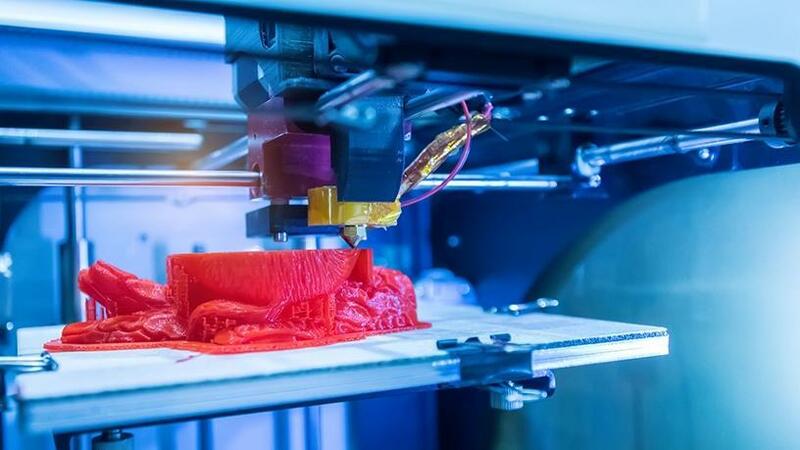 3D printers that have the ability to process ABS plastics usually operate at a high temperature (around 210-250 degrees Celsius or 410-482 Fahrenheit). PVA is a special water-soluble type of plastic. It should always be kept in a sealed box or container with a desiccant and dried before use. PVA usually works at a temperature of 190 degrees Celsius (or 374 Fahrenheit). However, the fact that it attracts a lot of water makes it harder to use as air moisture would quickly deteriorate the filament. PETG looks to combine the advantages of both ABS and PLA into one material, and it does a good job at it. It’s hard and heat-resistant like ABD and doesn’t require a heated bed to print like PLA. It’s also great at handling impacts and is food-safe. However, printing with PETG is quite a slow process and is generally more expensive than the other two. Filaments contain powdered particles of wood and metals such as brass, copper, and iron. They’re mixed with standard PLA and combined with the addition of polymers to act like PLA but have the feel and the appearance of the added material. Even though they’re supported by most PLA-compatible 3D printers, they require specific temperature adjustments and are quite pricier than using plain PLA. What are the things that I should look for in a 3D printer? Your printer should work quietly and not be too big or too heavy. It also shouldn’t produce any fumes or odors that may be unsafe for the user. Your printer should create a prototype of quality that looks nice as a finished product. This means the layers should be thin and hardly noticeable. Your 3D printer should be accessible to various connectivity options, if not all. This means you should be able to print over WiFi or to transfer files using a USB cable. Making sure your printing space is enclosed means you’re provided with consistent temperature for your printing jobs. Keeping the temperature consistency is of utmost importance when it comes to 3D printing as changes might alter the shape of the final product. Your printer should come with a heated bed to prevent the printed prototypes from warping. The heated bed also helps the objects stick on the print bed properly in order to allow more materials to be added on top. Since ABS is one of the most common plastics in 3D printing, it’s worth mentioning that it shrinks as it cools down. This is why having a heated bed is important. Refills are usually bought from the vendor of the printer, but filaments can come from different brands. You should make sure that your printer is compatible with all brands of filament. Apart from not being able to print except one object at a time, you’re also limited to the size of the object you want to 3D print. Most 3D printers can only print items that measure only 1 cubic yard if you’re using polymer and that measure 1 cubic foot if you’re using metal. And even though houses were built using 3D printers in China, they had their own limitations. And the 3D printer that was used to build those houses isn’t currently commercially available. 3D printers can only print one object at a time. This means you get the maximum level of customization but also it means that you can’t use 3D printing for economies of scale. Economies of scale means producing a lot of the same product to reduce the cost per unit. Something that is, of course, out of reach of the 3D printing abilities. Despite the fact that on the long run, a 3D printer ends up paying for itself more than once, the initial cost of buying and setting up a 3D printer is still quite high and constitutes a roadblock for the average individual or business. It’s not all in the cost of the printer itself but also the materials you require for 3D printing. And although 3D printing doesn’t require skilled labor, to truly make the best use of it, you might need excellent CAD professionals, which requires a couple of extra bucks. It’s quite common to have a poor finish quality of the object you’ve printed. There may be some problems with the accuracy of the dimensions and definitely with the lack of polish. You can easily fix these problems with post-processing methods, but these methods can be very tedious and complicated. 3D printing is opening whole new worlds for engineers and designers as they have a new ability to produce models from designs that they generate on a computer. you’re going to really appreciate the possibilities it provides you.